WHY LETTERPRESS – IT’S A DEAD ART, ISN’T IT? 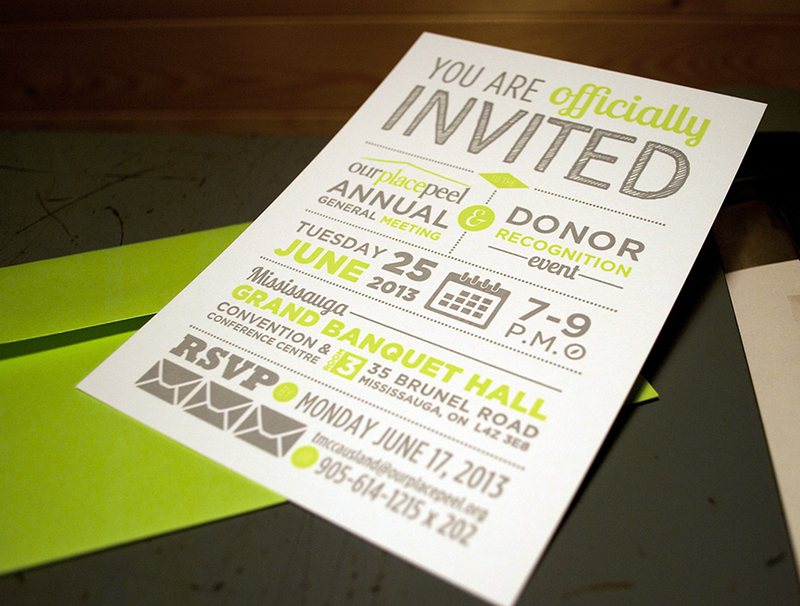 Over the years, we’ve been asked by friends and customers – why letterpress? The next question they usually ask is, can you make money in it? Well the truth is, for us, it’s a labour of love… literally. There is a ton of work that goes into this, and yes a lot of investment of money and time. One Vandercook SP15 can be anywhere from $3K to $8k+. So before you commit to something like that, you’d better be sure you really love it. Many print shops do make money, they tend to be trade shops that will print, and can print, just about anything – beautiful work. We’re not a trade shop so we pick projects that inspire us and allow us to get better at the craft. In the Letterpress community, there are artists who illustrate books by carving wood and creating some of the most beautiful books we’ve ever seen. This is a skill I hope to learn and maybe someday master, for now I’ll stick with linocuts. There are typesetters who know how to hand-set pages and pages of metal type, and make it seem so easy. They use letters and words to create wonderful examples of text as the image. And until you have held one of these books in your hands, you will never understand why some people hate the e-reader. The community is filled with oldtimers and upstarts all sharing ideas and knowledge, and we’ve had the fortune of meeting some great and generous people at shows like Grimsby Wayzgoose and OCADU Book Arts Fair making some good friendships along the way. Then there are people like us, a graphic designer and an advertising account person, who love the entire world of letterpress. As a designer I bring my own flavour to letterpress. I do love the printing process – ink is in my blood now, and under my nails! 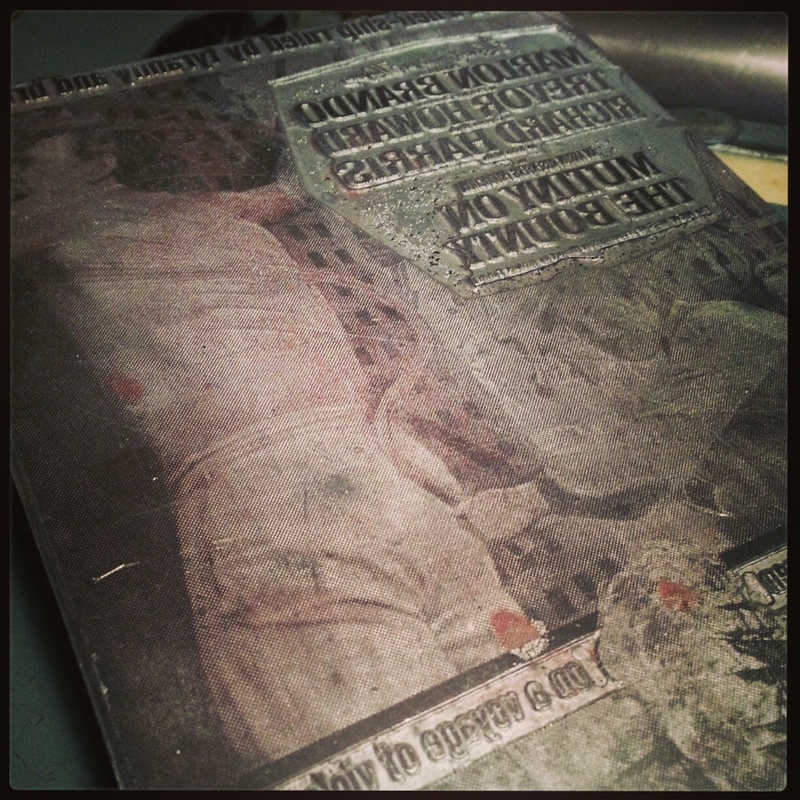 I love discovering different papers; I love tinkering and maintaining our press, and I equally love the design process. The use of the MAC married with polymer plates has allowed me to do things I couldn’t to do with metal and wood type alone. This community is now what is left between the past and the future. If print dies, then on that day I will be very sad. But, I know in my heart it will never really die as long as we and others like us continue to tinker and toil, cut and set, press and roll all of the amazing things we all print. No matter what style, what paper, which font, or language – it’s all good. We love the past and merging it with the present. Whatever the digital world has in store, it will never have the tactile feel of print. A touch screen is cool, but there is still something getting in the way. Sure a virtual world can have benefits, but sometimes you need to get your hands dirty. Even as we are all more and more plugged in, we seem to be missing the boat – technology is a wonderful tool, a tool to be used and controlled, not the other way around. Rather than connect us, in a lot of cases it has separated us. We can live behind the screen and never venture out into the real world. The photo below is a “Mutiny on the Bounty” movie poster plate. It’s 50 years old and can still be printed. It was made in a time when things were still made solid. Just imagine, making something with your own two hands. A print – being able to see, touch and actually feel something real. And that is why we love letterpress. It’s not dead yet. Over the last month we helped Pablo the Dog rebrand themselves. Their story is touching and you can learn more about them on their site. We liked what they were doing and agreed to work with them because of their alignment with some of our core values – quality, integrity and care. They are dedicated to improving the way dogs are fed by preparing the treats with fresh, good quality ingredients. And it seems like a nice fit with how we try to live and work, even though we don’t have dogs. (Before we took on the project, cleared it with our two cats, Emma and Pica.) This is a great locally made product and what goes into them is more than just good ingredients, it’s the care and craft they put into every one of their Mutt Balls. After talking with the client and seeing that she was the illustrator (using her beloved pet as the model) we didn’t suggest a whole new logo and re-branding. The idea was there, it just needed a little push to become more modern, clean, impactful and refreshed. The main focus is still Pablo, and by taking what was already there we were able to refine the typography, colour palette, placement and basic logo structure the brand now has a more professional image and a better first impression for new clients. And both the client and ourselves are happy with the updated look and feel. Every once in a while we get asked to provide print-only services. It’s not often we say yes because we miss out on the other fun part of the equation: design. We were approached by the ladies at Patch Design to print a charity event invite for their client Our Place Peel – a Youth Charity in Brampton. Great cause, brightly coloured and a simple design all made this an easy project to say yes to. Hope the event is a great success! PRINT SPECS: Standard 5″ x 7″ / 2 colour / printed on Mohawk Strathmore 110# Bright White Wove. Bright lime green envelopes were from Clear Bags Canada. We haven’t posted in a while so here’s a quick one, with more to follow in the next few days… promise. In the world of social media it always amazes us how connections get made and things can happen so quickly (contrary to the “slow” process of letterpress). Through the Twitter-verse, we met Kevin September who wanted unique hand-crafted businesses cards for a trip to a Los Angeles media conference. After a little e-chatting, we met over coffee at our local Starbucks and had a great conversation about the arts in Oakville, design, advertising, letterpress – eventually we got to the business card brief. What we find amazing is how many internet professionals we encounter who want printed business cards or wedding invitations. In the world of pixels, designers and art directors rarely get to actually make anything physical anymore. So we love when people in that world still appreciate the finer details of letterpress printing. 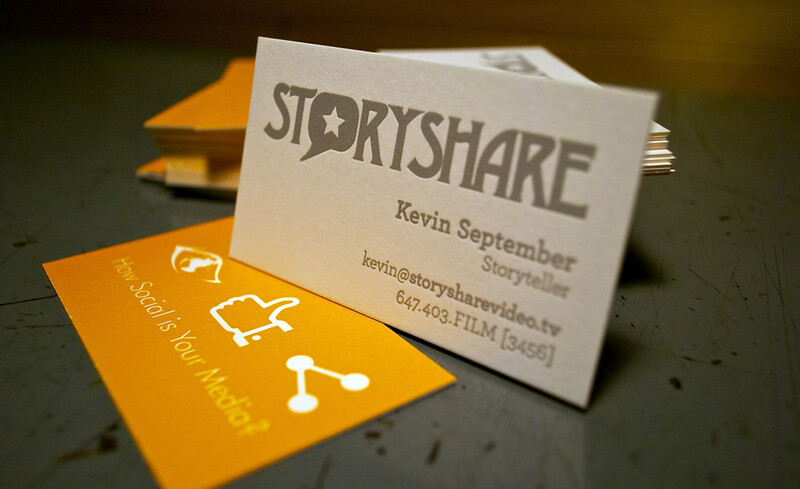 We designed these cards for Kevin who is truly a real Storyteller. Hopefully his trip will be a little more fruitful with these in hand.